Stephen Lashbrook was invited to participate at this international symposium on the future of music education. Stephen Lashbrook, teacher/consultant with the Toronto District School Board, is currently developing the One World Youth Arts Project, which will be a center for student learning and development and a national training centre for in-service and pre-service music teachers. Steve and his partner, Sharon Backman, develop and implement alternative music pedagogy and modern music education philosophy in the most culturally diverse city in the world. Prior to being engaged with the One World facility at Toronto’s Georges Vanier Secondary School, Steve was head of Performing Arts at Central Technical School. Steve and his students have received recognition from the Province of Ontario Music Educators Association and the Canadian Music Educators Association. He was voted Toronto’s Best Music Teacher by the NOW Magazine People’s Choice Poll in 1999. Steve is a sessional instructor and research partner at the University of Toronto Faculty of Music, an associate teacher with the Ontario Institute for Studies in Education, an associate of the Wilfrid Laurier University Center for the Advancement of Music in the Community and a program developer with the TDSB/Government of Canada-Alliance of Sector Councils. As consultant for the Hamilton-Wentworth District School Board, Steve produces the ‘Keeping the Dream Alive’ tribute to Dr. Martin Luther King Jr.—a showcase of music and performing arts by hundreds of Hamilton and Toronto public school students from incredibly diverse arts education programs alongside top commercial artists at Canada’s premier concert facilities. ‘Keeping the Dream Alive’ (Canada’s most important tribute to Dr. King) exemplifies the product of arts education that is excellent, inclusive and creative. The event demonstrates artistic endeavor that transcends the aesthetic to secure the status of the arts as the determinant of our humanity and a force for good in our global community. Steve’s work has been published in the Canadian Music Educators Journal and Education Today. His students have received news and documentary coverage by Much Music, TVOntario, Canadian Broadcasting Corporation, CITY-TV and CBC Radio as well as numerous print media. The One World CD productions are on demand deposit at the National Library of Canada. The Symposium will be held at Williams College, in Williamstown, Massachusetts, in the Berkshires, a 30-minute drive from the original site and approximately two and a half hours drive from Boston and New York. The Tanglewood I Symposium, composed of 34 members, was held in 1967 at Tanglewood in the Massachusetts Berkshires, and examined music in American society. The 5-1/2 day meeting was addressed by 17 guests and selected members spent 2-1/2 days producing the Report and recommendations for future action. Since the original Tanglewood, much has been learned about how the human community processes music, what values it attaches to music experience, and, most importantly, how people learn music. This is the subject of Tanglewood II, a duplication of Tanglewood I in spirit, but decidedly and substantially of the 21st century. Moreover, global perspectives have since become a paramount issue in its effects on musical styles, value transfer across cultures, fusions and amalgamations. An international group of 32 music educators and distinguished scholars germane to the field, selected by invitation, will meet to take up the challenges posed by the new century. In addition to a handful of administrators, there will be observers selected by application. To aid in deliberations, the Symposium will be addressed by outstanding persons in a variety of fields through major lectures and panel discussions on selected topics. The more specific goals would be to cultivate a new understanding of music learning, to examine values of music in culture and its effect on transmission processes, and how schools, public and private at all levels, can meet the decades ahead with a deeper understanding of the role they can play in supporting a musical future. Tanglewood I, possibly the watershed event following World War II, has been a part of the Boston University consciousness for the last several decades. When the Music Education Department was reconstituted with new faculty in 2001, discussions naturally centered on the mission of the department. Inevitably, Tanglewood and the legacy of music education at Boston University arose in conversation. Should the school, known for its important contributions to music education via its outstanding graduates and programs, not be an impetus to examining music learning once again? The changes in the intervening four decades were considerable and have had and will continue to impact music learning that yet needs to be examined through a conscious and focused approach. Presently, there are numerous conferences and meetings that address various issues in the field. 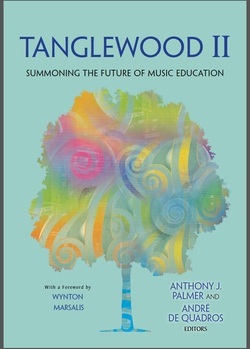 Tanglewood II does not aim to duplicate these; rather, the purpose is to utilize the information now available and to project a future that will act as a guide for music learning, both within and outside of formal programs. One way of gathering the information necessary for an in-depth examination is to hold several pre-symposium events with specific purposes and foci. These are contained in the area of the website under Pre-Symposium Events. We invite you to follow the progress of Tanglewood II and to take part through the Roundtable on our website. We need everyone’s ideas, particularly from the grassroots, those in the white-hot relationship between learner and student. We welcome your participation. Complete documentation is planned via digital video, stills, digital recording of written documents, podcasts and verbal presentations. These records will be made available on an official website and also in printed form. In addition, the Symposium will take advantage of Boston University’s graduate online program by developing two courses pertinent to the Symposium deliberations: 1) the major events such as Tanglewood I and others following World War II; 2) the substance of Tanglewood II with some podcasting of the presentations.